Functional wheat gluten has applications in the field of eco-toxic glues that are traditionally used in the making of particle board panels, or as a polymer for internal panels for cars. Wheat gluten is a nitrogen source for fermentation processes. 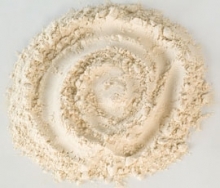 Wheat gluten is part of reliably pure and consistent substances that can be used as growth substrates and media for the production of a large number of intermediate products and active ingredients which are essential in the pharmaceutical, food, feed and agro industries.